Abraham Lincoln and Frederick Douglass were standing stone cold outside the New York Historical Society as pale grey snow clouds filled the sky. But inside, under portraits of America’s famous, the Carolina Herrera show was a burst of vivid shades. 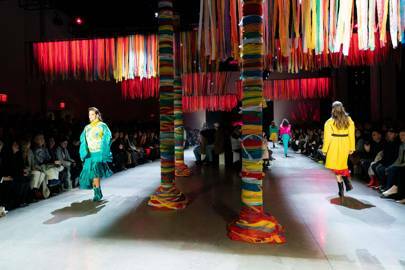 The New York collections for next winter are colourful and often dramatic, as designers offer break-out paint splashes for the next winter season. As history has proved, some of the boldest clothes appear in turbulent times. 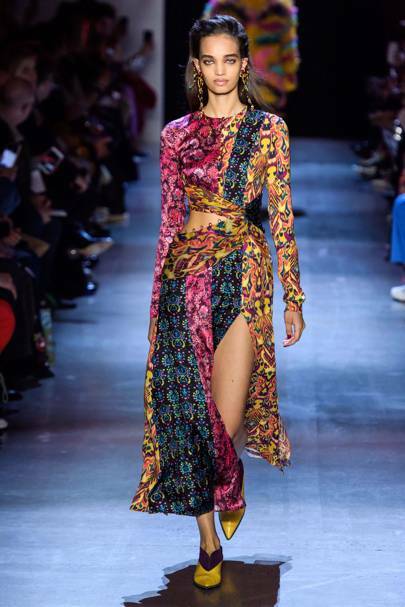 The slithering, painterly strokes from Sies Marjan and the vivid colour and pattern from Prabal Gurung contributed to a sense of ‘otherness’. The United States may be bitterly divided and the world may be in turmoil, but escapism is a fashion element for today. Carolina Herrera herself sat front row at the show, as ever, poised and elegant. But it is designer Wes Gordon who seems to be linking up with the founder’s Latin American origins. Colour was the overwhelming story and when the vast dresses were not boldly patterned, there were slits in tailored outfits to reveal thin slices of bared skin at the waist. More generally, loose cuts swirling down the runway suggested fashion freedom. This was what the current designer called ‘the minimal poise and maximum drama’ of Robert Mapplethorpe. The photographer’s still lives of flowers were what the designer called ‘sensual magnetism and grace’. Yet the show, with its extreme proportions – mostly large, but including A-shaped mini-dresses – seemed more like an expression of freedom. It was smart of Wes Gordon to attach friendly modern elements, defining ‘taxi-cab yellow’, which also applied to gilded ball earrings. 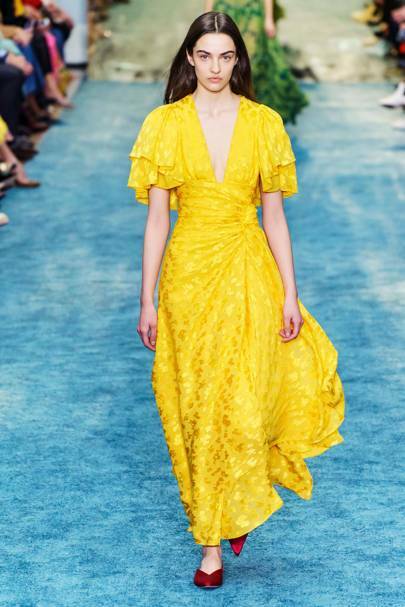 But, in spite of the designer’s energy and enthusiasm, there remains a nagging question: Will these clothes be bought and beloved, as Herrera’s originals were, by a new generation of uptown girls? Oh, the colours! 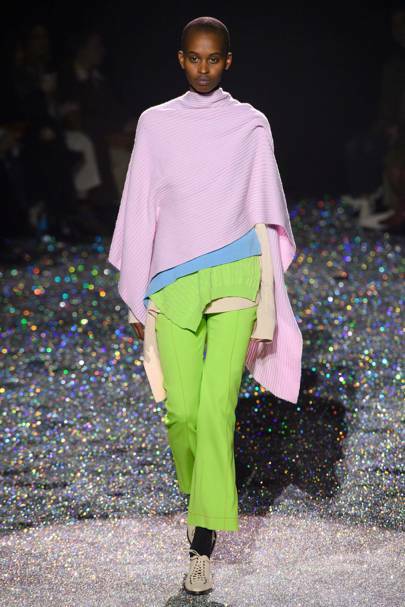 Mouthwatering mixes of a marshmallow-pink top with a sky-blue under-sweater and green trousers were all set against the glitter of Swarovski crystal across the floor. And that was just one of many painterly shaded outfits, simple in construction but imaginative in their ever-changing colour palettes. 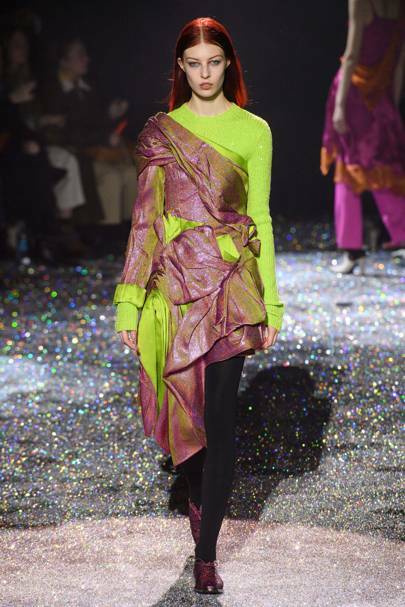 “I wanted to push my own boundaries and not rely on the comfort that I feel when working with some colours and fabrics. 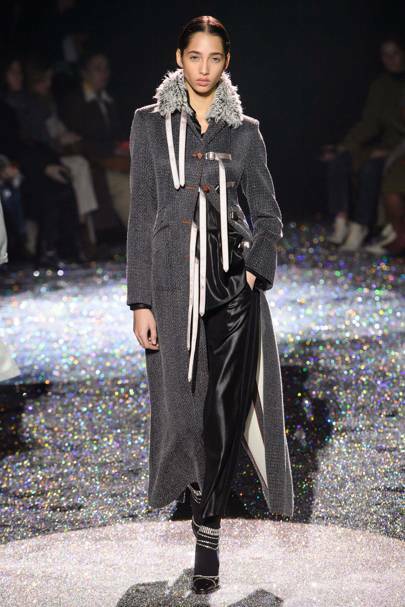 Instead, I used shades and textures that don’t feel exactly right to me, but I make them work,” said designer Sander Lak. He was referring to his use of black or silver-coin grey as colours, as well as neon shades in a fresh way, so that they did not seem clichéd. This was a collection where the liquid, long shapes of the clothes made no overall statement. Visually, however, their colours and textures were striking – even magical. The models displayed his relatively simple clothes, but these were in a range of exceptional textures, from emerald satin to saffron lace. These proved Sander Lak to be a great fashion colourist who is learning successfully how to make clothes that fit his fertile imagination. By keeping to his concept of drawing influences from many places, Prabal Gurung has found his fashion moment. Gurung was at Bill Blass for five years and then, a decade ago, set up his own label. Born in Singapore, raised in Kathmandu and trained in India, this ethnic Nepali is now in America, where the designer puts all that on stage without making it a round-the-world performance. 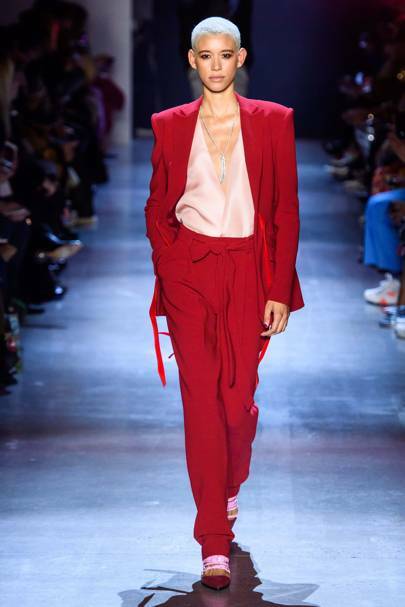 His secret is to use bold colour and pattern in simple pieces that might be just a plain red pantsuit as much as a slender dress that brings together panels of pattern. With individuality, rather than uniform designs, Prabal Gurung ticks many boxes. And even his signature colour strengths were matched for summer 2019 by a cute and curved black-and-white checked jacket. The ultimate in crossing continents was a graceful velvet dress that brought this fashion wanderer back to uptown New York.